Tired, like all mothers, I choose to stay awake just to have a little time for myself. Just a few minutes, I say, I’ll be in bed by 10. Yeah right! I’m never in bed by 10. Sometimes I listen to the nothingness of the night for a couple of hours, I listen to the quietness around me and take it all in, still trying to wind down after a long and exhausting day. I realize that I’ve been awake for a little bit too long. Alright, if I sleep now, I would expect my baby to wake up in half an hour for his bottle. So the dilemma begins: should I sleep or should I stay awake? Still questioning what to do next, my heavy eyelids give in and I fall asleep with the mobile phone in my hand, still open on the last page I was browsing. Barely a few minutes later, I wake up when I hear the tossing and turning of my little boy. And the night shift begins. Like some days, nights can be long. Many nights were spent sitting in bed with the baby in my arm and my head thrown on one side without any support to my neck. Do you know the neck strains you used to have in high school when you wouldn’t be able to move for almost a week? When you’re a mother, you are blessed with the miracle of feeling no pain! You know why? Because life must go on and you must be available, up and running at all times. So half asleep, I look at my boy and smile. It’s a true blessing to have a child who loves you and accepts you for who you are. My boy doesn’t know what I did in my life nor does he care. All that matters to him is that I’m his mother and I love him so much. After he drinks his bottle, he pushes himself off my arm and onto my bed. Cheeky boy. He knows he wants to sleep on our bed so he cuddles against his father who just can’t say no. Blessed, I smile and lay down. I look over at my two favorite boys and think that God has truly been generous. No-one said raising a child was easy; it’s a tough job only mothers can do. 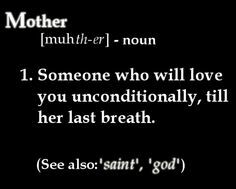 Mothers aren’t well rested, pampered, and manicured women, they are tired, exhausted, and fatigued saints.